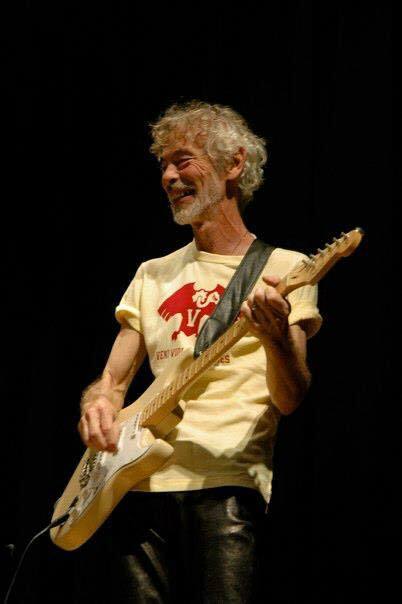 Mr. Patrick Duffy, whom so many of us were privileged to learn from, departed from this life early this morning. Mr. Patrick Duffy, former Latin professor. Rest in peace. I understand from a brief post of his daughter that the Memorare was one of his favorite prayers. Why wouldn’t it be? What a beautiful prayer of abandonment to the sweet Mother of God, Mary Most Holy. This is a prayer that Teresa of Calcutta called her “spiritual machine gun” after all. May I suggest we all pray several Memorares for the repose of the soul of this good teacher, this extraordinarily kindhearted man? I believe that if a man’s memory among those he leaves behind can evoke a smile then he probably accomplished some good on this earth. Is there anyone who sat in his Latin 101 who doesn’t associate the conjugation of “sum” with the song Blue Moon? Didn’t think so. Eternal rest grant unto him, O Lord and let perpetual light shine upon him. May his soul and the souls of all the faithful departed through the mercy of God rest in peace. Amen. Today is the feast of St. Francis de Sales, patron of writers/authors. My prayer today is that every word I commit to print may glorify God. Some of our alumni are bloggers, some have written books. Some, like me, are writing a book for the first time which we hope to have available on Kindle by summer – *cough*, *shamelessplug*. Some of us occasionally publish articles in periodicals. Some of us write lecture notes for the classes we teach that read like books. To my fellow alums who are writers, God bless you! 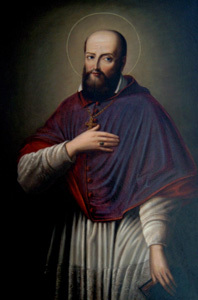 St. Francis de Sales, pray for us. Timothy Hester January 7, 2018 Comments Off on Alumni Map is Up and Running! 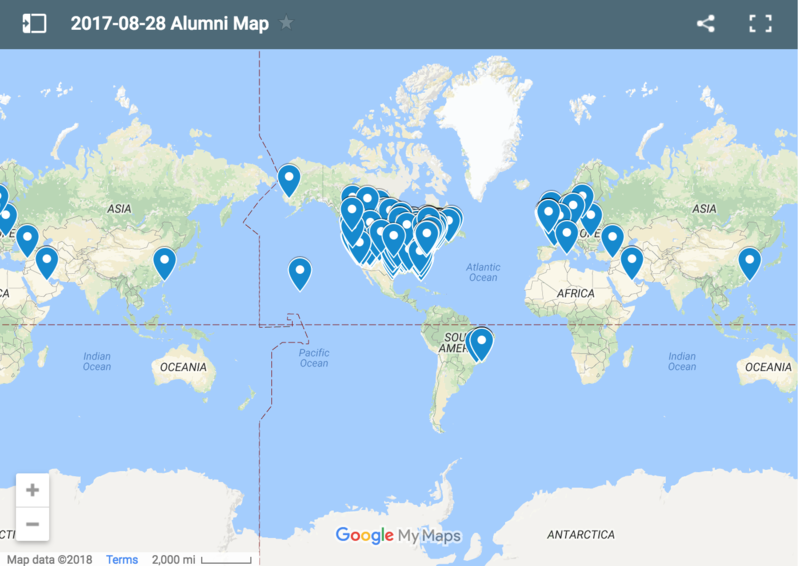 Alumni Map is Up and Running! Happy New Year, fellow Crusaders! I hope the celebration of Christmas continues to shine in each of your hearts and homes. It is still, after all, the season of Christmas. We still have another day in which to celebrate the joy of the Lord’s Nativity. Unless you belong to an Extraordinary Form parish in which case you may disregard this sentiment and party on until February. I, your very humble alumni blogger, am delighted to share with you an exciting new tool available to our alumni. So just what is this Alumni Map of which I speak? Thanks to the efforts of some very talented individuals, Christendom alumni now have the ability to stalk one another! I mean, wait… Let me repackage that last sentiment. When the Alumni Advisory Council first met one of many suggestions that emerged was the idea that alumni should be able to look at a map and see if there were fellow alums in their neck of the woods. Karla and I found that this would have been particularly helpful as we plotted which cities to visit during the Grill’n & Chill’n Summer Tour. So now it’s up and running… sort of. The alumni map is not as functional as we’d like it to be for the moment. That is because the alumni portal is not yet behind a security wall. One thing at a time. Don’t worry, though, because we’ve already had contractors make us several prototypes. I’m leaning toward the steel and reinforced concrete sample that not only prevents overland border crossings but has a foundation deep enough to stop the drug mules and their tunneling. But we’re talking about the alumni portal, not the southern border so let me come back to that. For the moment, the map will reveal to you where alumni live based on the information we have. What it will not tell you is which alumni live there nor will it give you exact addresses. Even the pinpoints are deliberately only approximate. Look at the samples below for proof. Here is a view showing Irving, TX. 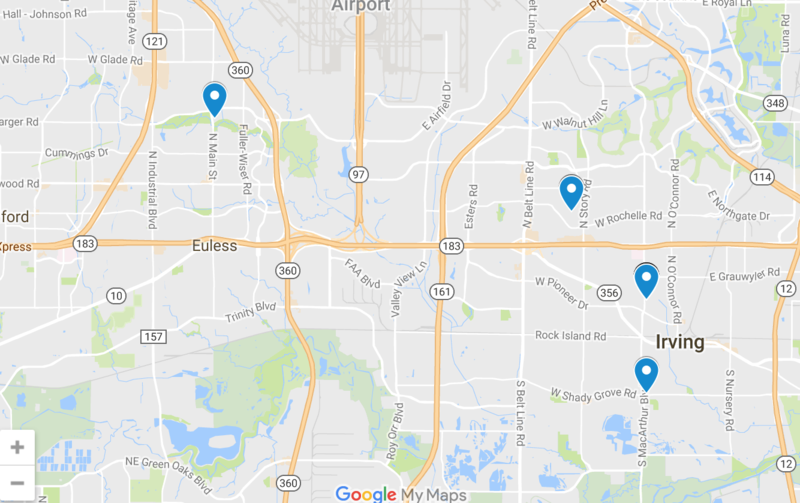 One of these dots is my house, one is my brother-in-law Kirk’s, one belongs to the Willards, and one is the Leggio’s. None of these are accurate within a mile but you get the idea. We can see that there is a small alumni community here. Finally we have a map of the Northern Virginia area. As you can see, the zoom feature would come in hand in such a view. Timothy Hester June 9, 2017 Comments Off on Welcome to “the Portal”! I write this post from my kitchen counter in Irving, Texas. My wife, the lovely Karla, and I are enjoying a quiet lunch at home. I have just returned from noon mass, ironically at the chapel of another small Catholic liberal arts college nearby. Our children are out for the day finishing a week of arts and crafts at a day camp. After a very busy year filled with plenty of insanity, unexpected cross-country travel, entertaining friends, activities for the kids, changing jobs, and so on and so forth; my wife and I have a rare afternoon to ourselves. Alone. I am looking at some pictures in another tab on my laptop. It’s a flashback of sorts. Google reminds me frequently of what I did “on this day” last year. The pictures are filled with Christendom alumni. I cannot believe it’s been a year. Those of you who followed the progress of last summer’s Grill’n & Chill’n Tour were part of something incredibly special. Whether you hosted an event, attended an event, or simply read about the road trip, you took part in the beginnings of Christendom’s alumni outreach endeavor. Throughout the eight weeks of driving (not to mention the few months of planning and the decompression afterward) I was keenly aware not only of the unique place in the life of the college this moment in time would be but also of my own privilege in being able to take part and, for better or worse, to be its scribe. Keep in mind I am an alumnus almost by default having attended Christendom for one solitary semester. For me, this was a big deal and an opportunity I did not want to squander. But summer faded all too soon. Autumn saw a series of Alumni Advisory Council meetings wherein the future of this outreach was discussed. All the data pointed to the fact that you, our wonderful alumni, wanted this to continue in one form or another. And so now, we launch in earnest the Alumni Portal! Take a look around. Get a feel for the site. Lots of new features beyond just the musings of yours truly (though my blog posts will continue). Weren’t you just looking at this page? In fact, we love this portal so much we’re plastering it everywhere! As we launch this operation together I want to ask each of you who are reading to offer a prayer. First, pray for the Church. It’s always a good idea. Second, pray for one another. Pray for those among us who may be ill or in need; for those who are lost; for those who have forgotten their faith or who struggle. Pray for those loved ones who have journeyed home to God and may still need our prayers to embark upon the final stretch. Pray for each other. And finally, pray for Christendom College. Pray for the current students and faculty. Pray for the young men and women currently considering whether Christendom is right for them (hint: it IS). Pray for the admissions team, the advancement folks, the kitchen staff, the grounds crew. Those for whom you pray in this moment will be those who pray for you when you need it most. So there’s the “prayer” part of the title. Here’s the “plea”. 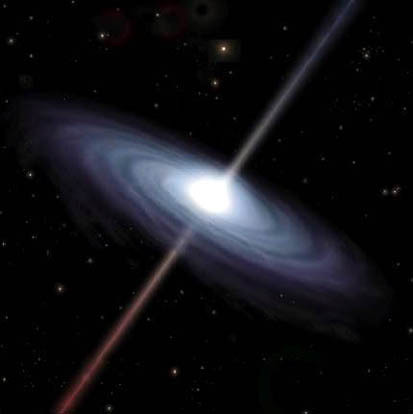 I ask you all to make use of this portal. Bookmark us. Better yet, make it a homepage. Mike Hichborn won’t mind if you swap us out with Lepanto, trust me… We ask that you visit us daily and give us your feedback. From job postings to keeping your information current, we hope we’ve made this page what you told us you wanted. Sure it’s a work in progress but we know you’ll continue to direct us in making it ever more stellar. If nothing else, stop in for the prayer requests. If you have suggestions for weekly topics to be covered by me in the blog posts, let me know. I am not the only blogger within this portal though I will have a recurring feature; but I do seek your input for the content of my portion. Help us out and help keep this effort going strong. An alumni council can only ever be as strong as the alumni base empowering it. Remember, this “portal” is a work in progress insofar as it is our first iteration. We hope to be able to include ALL of the things you’ve asked for like career development opportunities and a full alumni directory. That will come as we ultimately migrate to a password-protected site. But for now; let us hear from you! If you’re a lawyer, a stay-at-home mom, a doctor, a teacher (there are quite a few of us), an actuary, a broadcaster… Have you blogged before? Can you write? We are interested in running features and we know that many of you have much you could offer. Email Karla, Vince, or me and let us get you started. Also, don’t forget to tag us in your Instagram posts and to visit our Facebook and Twitter pages. Now that I’ve given you a few things to chew on, I shall return to my coffee which appears to have gone cold. Oh, the sacrifices I make for you wonderful people. Anyway, I kind of like iced coffee. The 2019 Alumni Lenten Retreat was amazing with more than 50 registered alumni participating. Alumni have graded the retreat as a “9” on a scale from 1 (poor) to 10 (excellent)! A Mass of Thanksgiving as well as a spiritual bouquet will be offered to Fr. Tom for his excellent retreat! These positions have been posted. Please share with colleagues. The deadline to apply is April 7. The Brewery Taproom Server supports Benedictine Brewery Taproom operations at the direction of the Brewery Taproom Manager. This person interacts with customers, tends bar and assists the Taproom Manager with a variety of tasks while maintaining a hospitable, inviting and positive customer service environment in accordance with the overall mission of the Brewery and Taproom. Under general supervision, the Custodian is responsible for custodial needs and care of the assigned areas as well as assisting with the set-up of facilities for events and meetings. The Custodian is responsible for keeping a running inventory of all cleaning supplies and notifying the Custodial Supervisor when supplies get low, as well as responding to repair calls for such activities as replacing a broken light or cleaning up a non-toxic spill. Note: The Part-time position is not eligible for benefits. Under general supervision, the Housekeeper helps to provide the best possible guest experience by maintaining a clean, sanitary, comfortable and tidy environment in the Guest House. This person exercises initiative in performing a broad range of housekeeping duties, while maintaining the highest health and safety standards and frequently interacting with individuals both within and outside of the organization. The mission of Mount Angel Abbey and Seminary is grounded in the Benedictine, Roman Catholic faith tradition that shapes our deepest values and way of life. We seek to foster an environment that honors and respects the inherent differences and gifts among our monks, students, faculty, employees, friends and guests. We cultivate a spirit of inclusiveness and respect for others that neither denies nor exaggerates differences. Located on a hill overlooking the town of Mount Angel and the farmland of the Willamette Valley, Mount Angel Abbey offers a unique work environment. Mount Angel Abbey is an equal opportunity employer. A pre-employment background check and drug screen are required. The ancient Phoenician capital of Carthage was destroyed by the Romans at the end of the Punic Wars in 146 B.C. But the conquers built on its ruins a new city, which became the capital of the imperial province of Africa. Roman Carthage was a sophisticated place with great wealth and prestigious civil institutions by the time Thascius Cyprianus was born there around the year A.D. 200. We know a lot about Cyprian as bishop, martyr, and important Latin Church Father, but not much about his pre-Christian life. His deacon and biographer, Pontius, and Cyprian himself give only a few details, but what they reveal is significant, and gives us some sense of the way that faith was often communicated in the early Church. Cyprian came from a prominent pagan family, and became a public official and a leading citizen of Carthage. He was a man of wealth and status, accustomed to a life of luxury, expensive ornamental clothing, the finest food, and the pursuit of political ambition. Cyprian tells us that he had “grown old” in his habits (he was probably over forty years old at the time of his baptism). 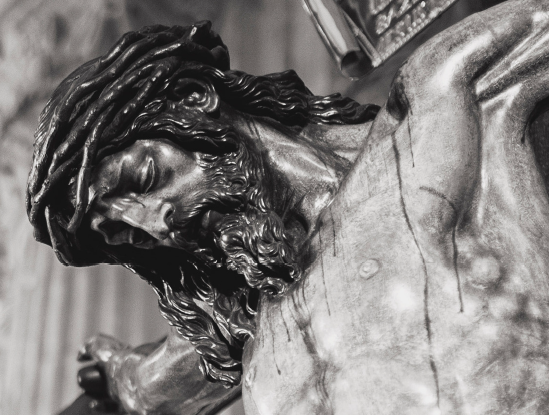 Something happened that changed him from a rich, decadent, middle-aged Roman magistrate to a fiery apostle for Jesus Christ and the Church who was willing to endure privations and dangers, and ultimately to give his life for his faith. The grace of this remarkable conversion came through the ordinary circumstances of a human companionship. While immersed in all his busy affairs, Cyprian met a Christian named Cecilius, who accompanied him in friendship and bore witness to Jesus in a compelling manner. Cecilius was a priest who also had a wife and family. What we know indicates that he and Cyprian developed a warm, familiar friendship over time. On his deathbed Cecilius entrusted his wife and children to the care of Cyprian, which shows the level of trust and esteem that they had for each other. Cecilius was clearly a man who was accessible to someone like Thascius Cyprianus, a public figure in the pagan Carthage of the 3rd century. He opened his heart and his home to Cyprian, who found within this hospitality the possibility for a new way of life. Cyprian tells us that he was greatly attracted by this life, but at first it seemed impossible for someone like him to change from his selfish, ambitious, indulgent lifestyle. With the help of Cecilius, however, Cyprian studied the Scriptures, and the attraction of Christ won his heart. While still a catechumen, he committed himself to chastity (a significant change from his former ways). He also sold his extensive properties and gave the money to the poor. In all this, Cecilius (along with his household) was such a companion, support, and inspiration, that Cyprian took his friend’s name at the baptismal font on Easter of the year 246. Thascius Cecilius Cyprianus – Saint Cyprian – was destined to lead the Church in Carthage through a dark and terrible persecution. He accomplished all of his labors as bishop, martyr, and Church Father in the remaining twelve years of his life. 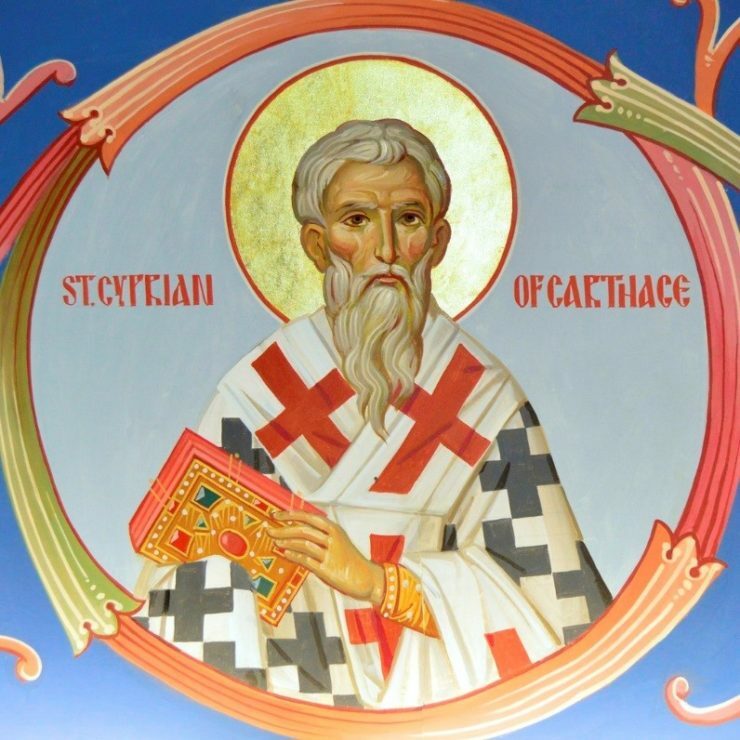 Cyprian’s conversion is a striking example of the person-to-person evangelization of Late Antiquity. In his life, an encounter with Christ and the Church through a human friendship bore abundant fruit. John Janaro is associate professor emeritus of theology at Christendom College, and author of Never Give Up: My Life and God’s Mercy (Servant Books). He blogs at www.johnjanaro.com. I’ll cut right to the chase. This is a call for a little bit of assistance on the part of you, the great Christendom alumni family. If you took part in any of the Grill’n & Chill’n events last summer (2016), have an iPhone, and a few spare moments of time send me an email at tmhester@gmail.com. Your help is greatly appreciated.